Netflix announced Wednesday that it has acquired worldwide rights to Sandi Tan’s documentary feature “Shirkers,” which won the Directing Award in World Cinema Documentary following its world premiere at the 2018 Sundance Film Festival. The film screened to great acclaim and will next be shown at the True/False Film Festival in Columbia, Missouri, on March 2. An inspired labor of love for zine-making teens Sandi Tan, Jasmine Ng and Sophie Siddique, “Shirkers” was a Singapore-made 1992 cult classic — or it would have been, had the 16mm footage not been stolen by their enigmatic American collaborator Georges Cardona, who disappeared. More than two decades later, Tan, now a novelist in L.A., returns to the country of her youth and to the memories of a man who both enabled and thwarted her dreams. Magically, too, she returns to the film itself, revived in a way she never could have imagined. Netflix also announced Wednesday that it has acquired “Zion,” a 10-minute film directed by Floyd Russ about a young wrestler who was born without legs and finds acceptance and community within the world of wrestling. Clark, who grew up in foster care, began wrestling in second grade against his able-bodied peers. The physical challenge became a therapeutic outlet and gave him a sense of family. Moving from foster home to foster home, wrestling became the only constant thing in his childhood. Josh Braun of Submarine negotiated the “Shirkers” deal on behalf of the filmmakers. February will fly by with all the new programming to watch on Netflix. Plus, you can pretend it's Valentine's Day every night with all of the Netflix and chilling you'll be doing. Scroll through for our curated picks of shows and movies you won't want to miss. Arriving February 1: "Ocean's 13"
Prepare for the all-female reboot coming out this year by watching the third installment of director Steven Soderbergh's "Ocean's" trilogy. With an aesthetic of Black Mirror meets Blade Runner, "Altered Carbon" tells the story of a man brought back to life after 250 years into a new body to solve a murder. "House of Cards" alum Joel Kinnaman stars next to James Purefoy. Snoop Dogg is stepping off the stage and onto the football field in "Coach Snoop," which follows the rapper through eight episodes as he teaches kids about football--and life--in the Snoop Youth Football League. Bobby Berk, Karamo Brown, Antoni Porowski, Jonathan Van Ness, and Tan France are your new Fab 5 in Netflix's reboot of the Bravo original "Queer Eye for the Straight Guy." Season 1 will take the group from New York to Atlanta, Georgia, to give makeovers and open minds. Arriving February 9: "Seeing Allred"
Get to know the famous civil rights lawyer Gloria Allred a little bit better in this Netflix Original documentary about the women's rights champion. Movie star George Clooney joins Letterman on his Netflix talk show. He's part of an impressive lineup including Barack Obama--Letterman's first guest--Malala Yousafzai, Jay-Z, Tina Fey, and Howard Stern. Go back to 1996 in Boring, Oregon: a simpler time when substitute teachers were just "educational" videos, delete meant whipping out the White Out, and, well, everything sucked. 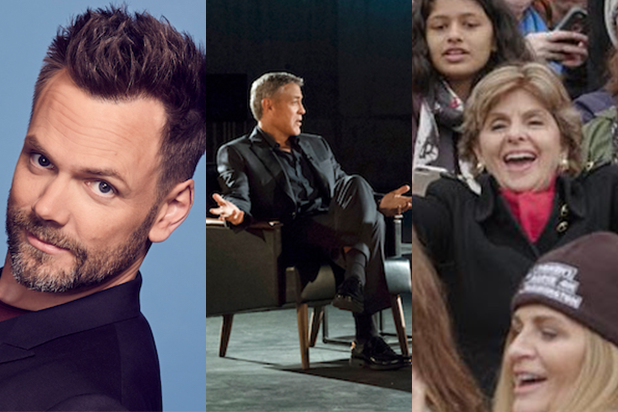 Arriving February 18: "The Joel McHale Show With Joel McHale"
"The Soup" alum is coming to Netflix to give you a weekly roundup of pop culture news, with new episodes airing on Sundays. From the BBC, Sean Bean stars in this period drama about something that does more than just go bump in the night in 19th Century London. Daniel Day Lewis may be done with acting after his performance in the recently Oscar-nominated "Phantom Thread," but you'd never know because you can re-watch his Oscar-winning performance as the sixteenth president in "Lincoln." Arriving February 23: "Ugly Delicious"
Chef David Chang takes us on a food journey in the new docu-series "Ugly Delicious," which will take a look at how food and culture go hand in hand. Say goodbye to Peter, Lois and baby Stewie, because Netflix is saying goodbye to Quahog, R.I. on Valentine's Day. Binge up! Leaving February 20: "Aziz Ansari: Dangerously Delicious"
Aziz Ansari's comedy stand-up "Dangerously Delicious" is leaving the platform on Feb. 20. His Netflix specials, "Buried Alive" and "Live at Madison Square Garden," will remain, along with his comedy series "Master of None."